It's a new marketing strategy to promote a movie premiere. 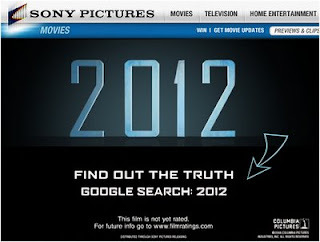 It happens in Roland Emerich's new Movie, 2012. The first teaser trailer came out with only the number in a black background and with an off-voice saying that you should search into Google to know what this number is about. It is obviously a good idea because in this case the audience doesn't have to memorize any complex web address and also makes you want to know what it is about. But the curious thing is that the Movie's Official Website doesn't appear anywhere on the top 10 google results. They don't even need it, any information provided by any website comes into result to promote the Movie.